DIVA, NBC Univesal International Network, presents How Do I Look? Asia, the highly anticipated Asian re-imagination of the hit fashion makeover series. Starting Monday August 31 8PM (SIN/MAL), we can now watch how to fix and learn the trends in fashion. 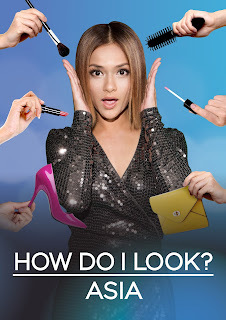 The NBC Universal International format, produced by NBC Universal’s Matchbox Asia, with the Malaysian celebrity and style icon Sazzy Falak that will guide the eight fashion victims until they will enlightenment all about fashion. On the other hand Jeannie Mai, will setting up the fashion challenges each week. Sazzy and Jeannie will help fashion-challenged victims like the onesie-addict/blogger Apple (Philippines); indie rock guitarist Ariana (Malaysia); mismatch, mishap/watercolor artist Choc (Taiwan); sales executive, and literally “plain” Jane (Philippines/Australia); overachieving, yet outdated,Lavinya (Malaysia); rebel teacher Lianni (Philippines); romantically-insecure Maisarah (Singapore); and the uninspiringly-dressed motivational speaker Yessinta (Indonesia). Each episode the host will joined by the professionals in this field like, Liz Uy (Filipina celebrity stylist); Zac Wu (Taiwanese celebrity stylist); Andrea Wong (former editor of Elle Malaysia); and Anindita Saryuf (fashion director of Elle Indonesia). As well as the what they called accomplice that can be a victim's family member, a friend, co-worker etc.